Kieran lives in the Meadows in Nottingham with his mother, who he loves, a bully of a step-father and his waster son. Life’s not easy like that – his step-father orders him about, barely allows him to be fed and calls him a retard. The waster son watches violent stuff on Xbox all day and joins in with a bit of bullying on the side too. It’s even harder if you are a bit different. When you’re a child whose favourite artist is LS Lowry, when you know the rules of grammar and your specialist teaching assistant helps you get by at school, but wants to know what is going on in your homelife. In the playground you learn to stay on the outside, to keep away but the bullies still find you. Your mum tries to protect you but even she loses patience sometimes, telling you she doesn’t have time for that when you have to make your special moves when you get near home. Kim never uses words like autistic, but Kieran’s problems are clear enough. The problems are other people. The book opens with Kieran finding a body in the Trent, a tramp who the police, when they arrive, think simply fell in and drowned. The tramp’s friend, Jean, knows otherwise but nobody listens to her apart from Kieran. 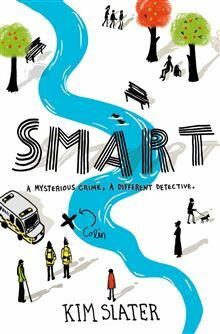 One of his obsessions is CSI so he sets out to solve the crime, which he does with the aid of his own drawing skills and the help of Karwana, a Ugandan boy who turns up at his school. Kieran – the book is in the first person – feels the need to explain everything to you, and tell you the ways you can win, even when you are losing. Along the way he sets out to visit his grandma in Mansfield. She’s banned from the house because she took on Tony, the step-father so he gets a bus to visit her. I sat near the back. It was 4.45 p.m. I tucked the ticket inside my notebook and refastened my satchel. At 4.45 p.m., I walked down the aisle to the driver. It was difficult walking when the bus was moving but not as hard as you think it would be, because there are silver rails to hold on to, all the way down. There’s a lot going on. Kieran drops by the homeless shelter to seek clues and finds the security man acting suspiciously. Wasn’t he the one he saw speaking to his mum? Tony – the step-father is dealing rocks from home, and there’s Tony’s vicious dog, confined to a shed since he bit the wrong person. There’s hints that Ryan, the waster son, is perhaps not as bad as he seems. But if you are Kieran you also need to find the special pencil sharpener that vanished from the kit you won for your art. No other pencil sharpener will do. Finding a murderer might just be easier. Smart is Kim Slater’s first book for older children. There’s two more I’ll be reading soon. Impressed.